Lydden Meadow is an attractive farmstead style development of ten high quality, energy efficient homes. Set in an Area of Outstanding Natural Beauty (AONB) these homes have been built to provide affordable housing primarily for people with close connections to the village through residency, family or work. Information about the Trust and availability of its homes will be made available through notices on the village notice boards, via the parish council, on the Buckland Newton Community website at www.bucklandnewton.com and through information available at housing advice offices and via WDDC Home Choice publicity with a clear restriction on local eligibility. Applicants who are not already on the WDDC Joint Housing Register will be asked to complete a WDDC application form giving information about their circumstances and reasons for application. Applicants will also be asked to register their interest with BNCPT using the form downloadable from the website, or available form the Trust. This form must be returned to the Secretary within two weeks of the date a vacancy is first advertised. The secretary will acknowledge receipt within one week confirming the date of receipt of their application and advise whether the applicant/s appear to meet the local needs criteria. The Trust Secretary will maintain a register of all applicants. 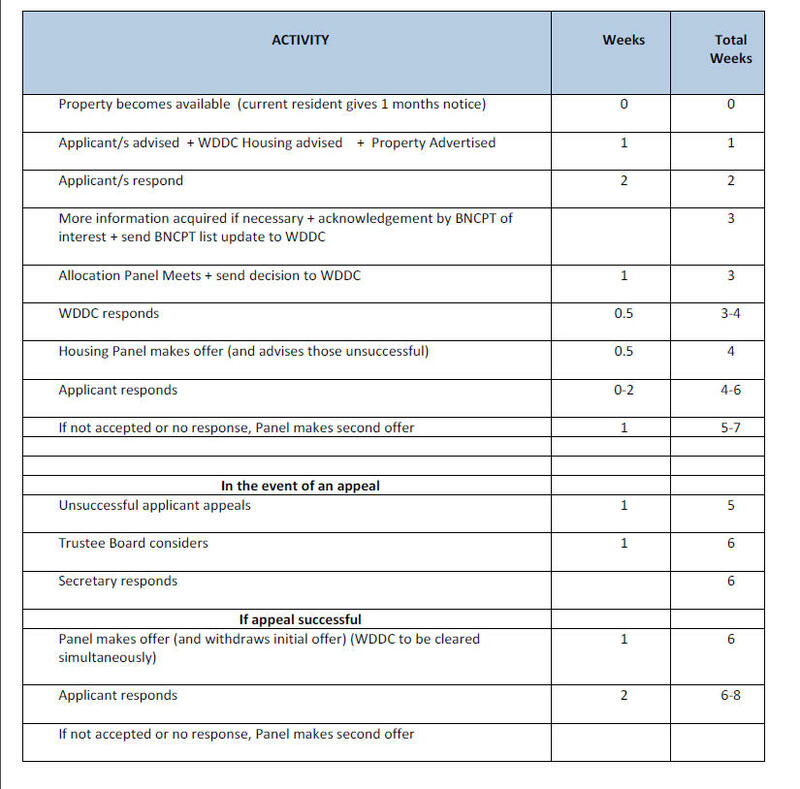 This register will be copied to WDDC on an annual basis following the Trust’s AGM and additionally 2 weeks after a housing vacancy is advertised. Personal information will only be held by WDDC, but will be made available for a short period to BNCPT to assist allocation. All personal information made available to BNCPT will be destroyed immediately the allocation process has been completed. What is the Housing Allocation Procedure?